Happy New Year! As much as I love the fun of the holidays, I always feel kind of refreshed when January rolls around. A new (mostly blank) calendar and a house free of Christmas nutcrackers does me good. A symbolic “do over” time for everyone, January holds a lot of possibility. We hit the ground running for sure – the gym is packed with well-intentioned go-getters. Weight loss commercials play nonstop on TV. The Target Christmas section is now a home-organization paradise, with bins and totes and hooks galore to help us find a place for our newly acquired stuff – and if we need more stuff, we can always hit the Valentines Day aisle, because it’s been up since before New Years. It’s all well and good – but what happens when we try and apply those New Years intentions to our spiritual lives? We start off with a bang, but it rarely lasts. The Bible reading plan we began tapers off once we reach Leviticus. That calendar begins to fill up. Duty replaces passion. The excitement for what could have been fades away. We are disappointed with ourselves for not sticking it out. We go to church, read some books, get some pointers… but the spirit in us is not engaged. By March or April, we return to the same old routine. We aren’t created for resignation, however. Why do I say that? Because the next January 1st we will do it all over again. So, the desire to grow and know God more is a part of who we are. Why then, do we lose it so quickly? 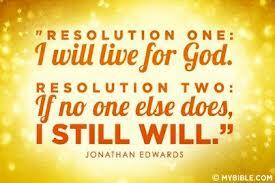 Try as we may to organize our spirit life, there is a wildness about God and life that we can not get a hold of. His desire is to make us holy, to be in relationship with us. You can’t compartmentalize holiness. You cannot make a system out of it. Systems last until February. Here’s a thought: What if we embraced the desire in us, that wonderful drive we feel at New Years to do great things, and just handed it over to the God who gave us the desires in the first place? The goal isn’t to be comfortable and organized – the goal is to get out there with those desires and let God lead us through the wilds and the unexpected into our victory. What if the excitement of January could be turned into a year long adventure of actual achievements? It’s not foolproof, and we aren’t perfect, but how about going in His strength instead of our own? How about asking Him what His desires are for us this coming year? We aren’t meant to set and attain goals alone. We aren’t meant to rely on human strength or wisdom to get us to the finish line. Our “deep yearnings of the soul” can be fulfilled by one thing alone, and that is a holy God making us holy. Don’t let the messages of January turn to disappointment in a few weeks – embrace the desires God has placed in your heart and ask Him to walk it out with you. His ways may be a bit wilder than we expect or a bit messier than we want – but they are the only way in which we will ever have true success. Long live the January goals! So true…’the deep yearnings of the soul’ can only be satisfied by our knowing God, and fulfilling His will for our lives. A beautiful post!